After having taken the poll about using technology in the classroom on the Facebook page of the International Teacher Development Institute, I'd like to recommend my favorite web 2.0 tool that my students and I used - and liked - the most over the past year. 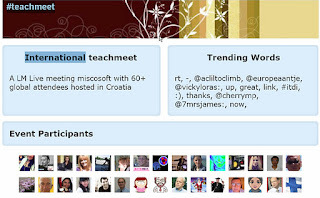 Wikispaces is definitely Number 1 on my list. I started using wikis three years ago, then moved from there to blogs (I tried all of them: wordpress, edublogs and blogger) and the Google sites as well. 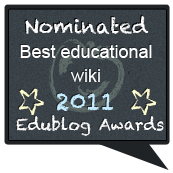 But this year I returned to the wiki - I think wikis convey the true essence of Web 2.0 - collaboration! It's amazing how easily we can work with students and teachers from all parts of the world. Even teachers who aren't tech-savvy can easily use it and keep it running smoothly. 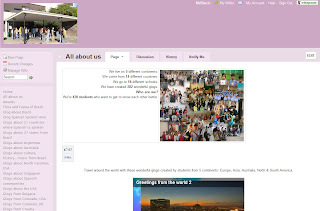 Here's my Greeting from the world wiki, which has connected more than 500 students and educators from across six continents. and it brought me to an amazing lesson which I did in my class today. The author is Ian James, a teacher with fantastic ideas and great lesson plans. What would you do.... if you came across these videos? is a lesson on 2nd conditional in a completely different and very real kind of way. And it came as if on cue, because I've just finished the conditionals with my students. What's more, I'm their classroom teacher (something of an advisor or home room teacher) and we've been discussing bullying and violent behaviour among teenagers quite a lot lately and the video that we saw this morning triggered an interesting discussion on teen dating violence - during which they used 2nd conditional without noticing that they were actually practising a grammatical concept. 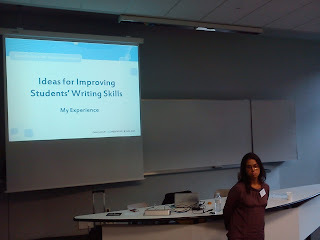 At TESOL France my greatest wish was to be omnipresent and to attend different sessions at the same time! Because with 68 attractive talks and workshops given by amazing educators from 27 countries we were literally spoilt for choice. But in the end, a choice had to be made, regardless of how difficult it was to decide which session to go to. Fortunately, the post-conference buzz is still going on all over the blogosphere and twitterverse with blog posts, tweets, videos and photos of the speakers we didn't get a chance to see, so that they've all come alive in Vicky's posts on Day 1, Day 2 and Day 3, in Ceri's Echoes of Paris, in Brad's #TESOLfr made me think thrice and Shelly's Sharing Stories. Here are some of the most interesting thoughts, ideas, activities and links that I learned from the speakers whose sessions I attended. I just arrived from Paris where I attended the 30th TESOL France conference, which was perfectly organized by the wonderful Bethany Cagnol and her amazing team. Those three days were absolutely fabulous. I'm delighted not only because I was there, but also because I met many of my Twitter friends in person. Another thing is that my presentation went well, especially as it was my first international presentation ever. my wonderful Twitter and Facebook friends Valentina Dodge, Elizabeth Anne, Helen Noire and Sue Annan. and Shelly Terrell, my good fairy of the internet, without whom I would never be where I am now. Here's the slideshare of my talk. I hope you find some useful tools for creating online quizzes, tests and puzzles. Vicky Loras has recently started a new blog challenge What's your story? Vicky invited teachers from around the world to share their stories about the changes they've made that helped them become a better educator or a better person. Vicky herself has made some big changes in her life and so have so many other educators, people who I know from Twitter and Facebook and who took up the challenge and wrote amazing posts about their amazing lives. It's not an exaggeration to say that today the world is deeply saddened by Steve Jobs' death. I admire him greatly because he was a dreamer who dared to pursue his dream. As soon as I heard about this tragic loss, I knew I had to create an interactive exercise for all the students who regularly visit my website Moja matura. Inspired by Cecilia Lemos' speaking activity for advanced students, I created an open cloze test for upper-intermediate students and Sonja, my friend and co-founder of the website put the finishing touches to it with some nice photos. My activity is based on the Wikipeda's article on tributes to Steve Jobs given by notable Americans. When someone dies, it's so hard to find the right words to extend our condolences and this activity might be a great practice on how to do it. It was in October last year when a teacher from Turkey sent me a friendship request on Facebook. I gladly accepted it, as I really like connecting with teachers from all over the world. On the very same day, however, it turned out that he was not a teacher but a high school student. As my policy regarding student friends on Facebook is very strict, I defriended him immediately and explained clearly why I couldn't be his friend. The boy, however, didn't want to disappear from my Facebook page just like that and it took me several messages to find out what he really wanted. It turned out that he was eager to connect with students from Croatia because someone told him that Croatian girls were really pretty! The September edition of the ELT Carnival was hosted by a brilliant teacher from Istanbul, Eva Büyüksimkeşyan. The theme of this month's carnival was Warmers, Fillers and 1st Week Activities - because for most of us September means a new beginning - and meeting new students. Eva has compiled a fantastic list of posts about amazing acitvities for the first day of school, which would ease the nervousness many teachers feel before entering a new classroom. I contributed to the Carnival with my post - Who am I? - about one of my favourite icebreakers for large classes. But this year, I extended it a bit, and it worked very well with my students. In Redmond I had a wonderful opportunity to present at my First Teach Meet ever. If you don't know what a Teach Meet is you can take a look at this video. All our Teach Meet sessions were recorded on video, but while we're waiting for the videos to be uploaded, and following Fiona's suggestion, I made a screencast of my presentation on Live Meeting webinars for students. I just returned from Seattle where I attended a training for top 50 educators from 31 countries, organised by the Microsoft Partners in Learning Network. We were invited to Seattle to be trained to become teacher-trainers in innovative teaching and learning practices. 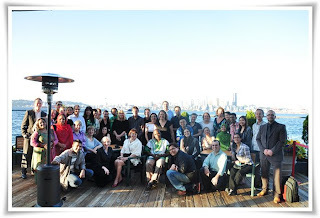 I feel tremendously proud and deeply honoured to be among the top 5o innovative educators from around the world who have been selected to attend the Microsoft Partners in Learning Institue 2011 in Seattle next week. During this activity-packed week we'll be learning how to improve our own teaching practices, how to effectively teach with technology, how to prepare our students for life in the 21st century and how to train other teachers to implement innovative teaching and learning practices. When Chiew asked me if he could interview me for iasku, his new blog series, I just couldn't believe my eyes! Me? He wants ME in his interview? I mean, his first interview was with Scott Thornbury! THE Scott Thornbury! What could I talk about that people would be interested in hearing? Of course, I felt immensely flattered and proud and a bit of a VIP and I agreed to do it. The interview was supposed to last up to 15 minutes, but I was kind of worried that I would say everything about my work in less than five. It turned out that it was too long so I had to cut out some of its parts! In January 2011 I applied for a two-week seminar about teaching pronunciation as part of the Comenius Professional Development Programme - and I got the grant! So, right now I'm in Cork, Ireland, together with 10 (mostly) English teachers from different EU countries (well, most of them are from Spain :-) and sharing the apartment in a student dorm with three nice teachers from Spain and one nice teacher from Romania. 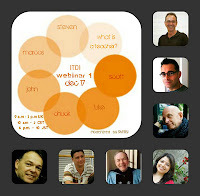 The webinars turned out to be a huge success both among the student and teacher population, so that we're now planning the second series of webinars for the next school year - but this time with even more teachers involved - because presenting online does not only pump up adrenalin, but it's also very contagious and addictive.